1 : 31680 This drawing covers part of north-east Lincolnshire, showing Grimsby and its harbour on the Humber estuary at top right. An important seaport since the Middle Ages, Grimsby declined in importance as its harbour became blocked by silt from the Humber. The harbour was improved and expanded in the 18th and 19th centuries. Grimsby is now the main fishing port of Great Britain. Metcalf, Edward B. 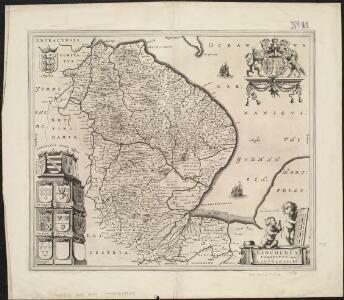 1 : 31680 This drawing covers part of Lincolnshire, showing drains across the fens highlighted in blue. These date from the 17th century, when James I appointed Dutch engineer Cornelius Vermuyden to direct the drainage of the wetlands. Many local people opposed the scheme as the plan involved commonland on which they grazed cattle. As a result of Vermuyden's work, the fens changed radically in appearance, from an area of flooded marshes to one of extensively farmed agricultural land. In the middle of the sheet is a series of decoy ponds, built in the 17th and 18th centuries to lure wildlife. Yeakell, Thomas Jr.
1 : 31680 This drawing covers parts of Lincolnshire and Cambridgeshire, showing the River Witham at the top of the sheet flowing south-eastwards into Boston and the Wash. Drains across fens and marshland are highlighted in blue towards the lower part of the plan. These date from the 17th century, when James I appointed Dutch engineer, Cornelius Vermuyden to direct the drainage of the wetlands. Many local people opposed the scheme since it included commonland on which they grazed cattle. As a result of Vermuyden's work, the fens changed radically in appearance, from an area of flooded marshes to one of extensively farmed land. Yeakell, Thomas Jr.